Do you ever wonder why some people perform better than others? Or do you wonder what the difference between multi-million dollar companies and companies that are just getting by? The answer might seem obvious. You might think, "it's because they sell more than I do," or "their product is better than mine." So, what is the factor that separates the winners from the losers? Your company's brand or even your own personal brand is what separates you from your competition. And it's what will get your customers to buy from you over and over again. Customers don't buy products, they buy perceptions and reputations. They buy certainty. They buy trust and likeability. They buy because they like your personal brand. Your brand, or reputation, is one of the most important factors in your life. It determines how people react and listen to you...it even determines how much you sell and how expensive your product is. Your brand image is so important that it cannot be left to chance. Once you've figured out exactly how you want to be seen, this program will teach you how to get the message to the masses! Get more sales, be promoted quickly and earn MORE money than ever before when you spread the word about the best brand in town-YOURS! Top Performers Know This Works! In my life, I've been at the bottom of the totem pole. I've gone from having the worst sales in the company to being the CEO...and I was able to get there because of my actions and my reputation for excellence. Fast-track your career by doing what myself and other Top Performers do everyday. Create your perfect brand and get results! Remember, how customers feel about your brand determines whether they will buy and how much they will pay. 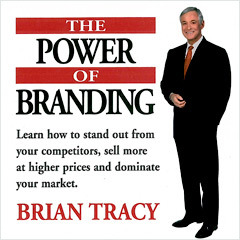 Use the Power of Branding to your greatest advantage and be paid top dollar every time! This one is newer. I bought this in November of 2006. Its New Years day and I would say I have listened to this 3 times. I have studied branding quite a bit in the last couple years and Brian’s CD presented the clearest, simple and “actionable” program on it I have been exposed to. The core concept is on promises. I have quoted this CD several times since I heard it. You can use this in your business life and personal life. Thanks Brian.